Get The Sceedo 8.5 Inch Off Road Bluetooth Electric Two wheeler Self-Balancing Board - Mix Lightning - Today For R3711 In South Africa! Purchase this product now and earn 3,711 Points! Sceedo 8.5 Inch Off Road Bluetooth Electric Two wheeler Self-Balancing Board -Maximum Speed Limit 10km/h, Max tilt around 15°-30°, Load 20-100kg, Lithium-ion 2.4 AH Battery, Voltage 36v, non-pneumatic hollow Tyres – Mix Lightning, Retail Box, 1 year Limit warranty. The Sceedo 8.5 Inch All Terrain Off Road Bluetooth Electric Two wheeler Self-Balancing Board is a classic design with LED headlight for all purpose, Benefit from the entirely new manoeuvrability and shock absorbing design, this ultimate All terrain Hoverboard will provide users an evolutionally riding experience. The boards ergonomic design and non-skid footpad combination gives your feet a solid grip to the board allowing you to effortlessly glide through corners with full and precise control. 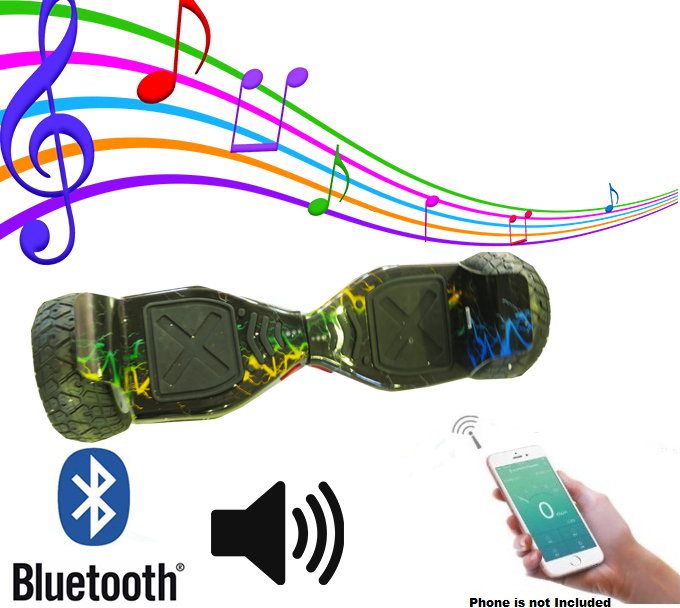 The Sceedo 8.5 Inch Electric Two wheeler Hands Free Self-Balancing Board with Built-in wireless Bluetooth speakers lets you play music from your Bluetooth enable phone. •Safe. Double balancing systems keep you in balance. •Easy to learn. Its robust body and anti-slip foot grip make it excellent for children and adults. •Long endurance. Up to 10 km range per Charge. •Small and light: Weighs only 10kg, can be taken everywhere. • Special safe board to protect battery from over charge or over discharge. The basic thing to know about the Sceedo 8.0 Inch Electric Two wheeler Hands Free Self-Balancing Board has the acceleration and stop functions , to Accelerate the rider just needs to lean forward and to Stop just move backwards , When a rider needs to turn left or right, he or she just needs to turn the right or left keeping the feet firmly on the anti-slip foot grip. The tilt sensors installed in the Sceedo electric Two wheeler Hands Free Self-Balancing Board work as an inner-ear balancing system. It simply means the Sceedo knows when you are going to lean forward or backward. To maintain the balance, you just need to drive at the right speed. The main part of the Sceedo Hands Free Self-Balancing Board scooter is sensor system, which is an assembled gyroscope. If a rider pushes on a point at the top of a spinning wheel, the system pushes a force on opposite ends of the wheel and this way it will balance itself out. • The electric-powered Hands Free Sceedo Self-Balancing Boards are eco-friendly and run on very low cost. • These run on rechargeable batteries with zero emission and almost noiseless. • These vehicles do not have enough power to run fast and cover large distances, but for 5-10 km, these are quite convenient. • These Sceedo 8.0 Inch Electric Two wheeler Hands Free Self-Balancing Boards are easy to operate and light to carry anywhere. • The low maintenance costs, less accident prone and lower power consumption make it a good alternative vehicle. • Electric scooters are an excellent alternative to motorcycles and bikes, if you have a limited use. • It can carry 100kg up to a maximum of -120kg weight including the rider, so it can be used to carry your grocery. • Battery Display: Battery display LED works when turned on. • Distance: around up to 15-20km(depends on rider’s weight, road conditions etc. • Low Battery Protection: when battery is lower than 10%, it will slow down and finally stop working.